We’re updating the 2-player games list to be tag-filterable and adding more games! While those updates happen you can still see the old list lower down on this page. (By Nathan D. Paoletta) One player takes on a singular champion of the Good, while the other builds the Blight of the Wicked. (Josh T. Jordan) A storytelling game for two: a child whose pet has just died and the child’s unreliable doll. (By Berengad Games) Set your wits and weapons against the deadliest of beasts. Challenge them, kill them, and use their blood in the ink of the tattoos commemorating your victory. (By Emily Care Boss) Play out two characters’ first three dates. Will they stay together? Collaborative, quick, romantic comedy role playing game. 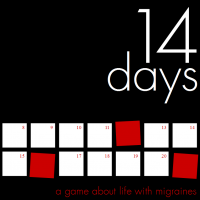 (By Hannah Shaffer & Evan Rowland) A 2-player game about juggling work, relationships, and hobbies around the reality of chronic pain. 14 Days (Hannah Shaffer & Evan Rowland) A 2-player game about juggling work, relationships, and hobbies around the reality of chronic pain. 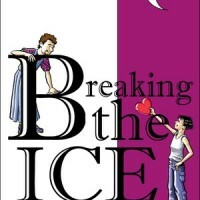 Breaking the Ice (Emily Care Boss) Play out two characters’ first three dates. Will they stay together? Collaborative, quick, romantic comedy role playing game. 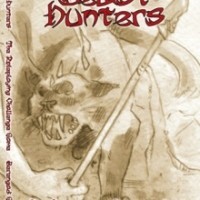 Beast Hunters (Berengad Games) Set your wits and weapons against the deadliest of beasts. Challenge them, kill them, and use their blood in the ink of the tattoos commemorating your victory. Cold Soldier (Bret Gillan) A story about the walking dead for two people. Currently unavailable. 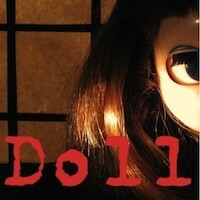 Doll (Josh T. Jordan) A storytelling game for two: a child whose pet has just died and the child’s unreliable doll. 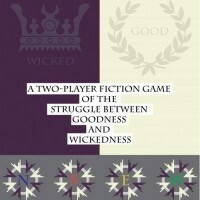 Fate’s Fickle Winds (Nathan Paoletta) In this two-player game, one player takes on a singular champion of the Good, while the other builds the Blight of the Wicked. 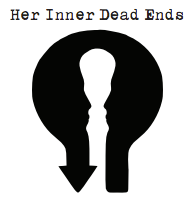 Her Inner Dead Ends (Francesco “Rugerfred” Sedda & Francesco Zani) Fans of a multimedia franchise meet for the first time, to discover that their online community has been erased. 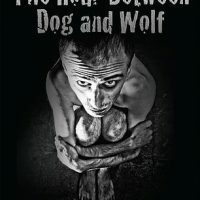 The Hour Between Dog and Wolf (Matthew Gwinn) A flawed hero faces off against a vile serial killer. One player takes on the role of the Hero, their opponent takes on the role of the Killer. Macabre Tales (Spectrum Games) Dominoes-based RPG of Lovecraftian horror in an authentic Lovecraftian style. Mars Colony (Tim Koppang) One player will take on the role of the colony’s appointed “savior,” while the other will be responsible for all the various problems that are plaguing the citizens of Mars. Mars Colony: 39 Dark (Tim Koppang) A sequel to Mars Colony, told from the perspective of the people. A game about political freedom and standing up for what’s right. One Shot (Tracy Barnett) One Shot is a two-player game of sacrifice and vengeance. The Last One (LuceOmbra) The Last One is a game for two people that tries to reproduce the feeling of a horror movie, building the setting on the player’s own fears. Our Radios Are Dying (Caitlynn Belle) A two-person freeform game about the strange finale to a strange relationship. PDF free; please consider supporting creator’s Patreon. One Missed Call (Hobbs & Hobbs) A story game for two players about loved ones separated by space, drifting apart or growing closer. PDF free. Showdown (Seth Ben-Ezra) A roleplaying game about two people who are locked in a struggle that can only end with the death of one of them. Sweet Agatha (Kevin Allen Jr.) Sweet Agatha is a bridge between the worlds of traditional fiction and cooperative storytelling. An engrossing mystery presented in a collection artifacts and a full-color journal. S/Lay w/Me (Ron Edwards) A sword & sorcery-inspired game about an encounter between a hero, a monster, and a potential lover. Scarlet Heroes (Kevin Crawford) Old-school tabletop RPG designed to provide classic sword & sorcery gaming for one player and one gamemaster. Shelter (Sara Williamson) One of many wonderful games from Indie Mixtape: Volume 1. Six Months, Three Days (Sara Williamson & James Stuart) An adaption of Charlie Jane Anders award winning story, Six Months, Three Days tells the story of one relationship, between the two only clairvoyants on the world. Premiering at Fastaval in April! Three Days (Avery Mcdaldno) When Graham first met Joanna, he fell in love instantly. Joanna knew that there was chemistry, but for her the feeling of love would take root after three days. Waiting for the Queen/Tea at Midnight (Jonathan Walton with Joshua Kashinsky) Players take on the role of a single character, Ruhi Nankachema (warrior maiden from the Country of Daughters) or Gai Zheng (determined son of a former Shaolin monk). Hot Guys Making Out (Ben Lehman) — Hot Guys Making Out is about the relationship between Honoré, a former nobleman, and Gonsalvo, his ward. They are both totally gorgeous and have the hots for each other. Also pretty often there are other people trying to kill them. The Quiet Year (Avery Mcdaldno) — The Quiet Year is a map game. You define the struggles of a post-apocalyptic community, and attempt to build something good within their quiet year. Every decision and every action is set against a backdrop of dwindling time and rising concern. Abnormal (Avery Mcdaldno) — A body horror game about social isolation, self-loathing, and dysmorphia. Downloadable PDFs on Patreon page. Era (Neil Gow) — In ERA, you take the role of classic solo heroes (think ‘Conan’) or enduring partnerships (think ‘Fafhrd and Grey Mouser’,’Han Solo and Chewbacca’ or ‘Elric and Moonglum’) and battle against a variety of legendary obstacles as you progress on your quest. Shooting the Moon (Emily Care Boss) — A love-triangle role playing game: two Suitors seek to win the heart of a shared Beloved. Create a dashing and romantic tale crafted for any setting you choose. Second in the Three Quick Games about the Human Heart trilogy, with Breaking the Ice and Under my Skin. Microscope (Ben Robbins) — You have vast power to create… and to destroy. Build beautiful, tranquil jewels of civilization and then consume them with nuclear fire. Zoom out to watch the majestic tide of history wash across empires, then zoom in and explore the lives of the people who endured it. Kingdom (Ben Robbins) — Your Kingdom can be any group or organization that interests you. You could play a Wild West frontier town, a colony ship crawling to a distant star, or a sprawling Empire holding conquered peoples beneath its thumb. Trollbabe (Ron Edwards) — A fantasy-adventure role-playing game featuring powerful female heroes in a Nordic setting. Its blend of player freedom, intense relationships, and epic violence has influenced dozens of subsequent role-playing games.